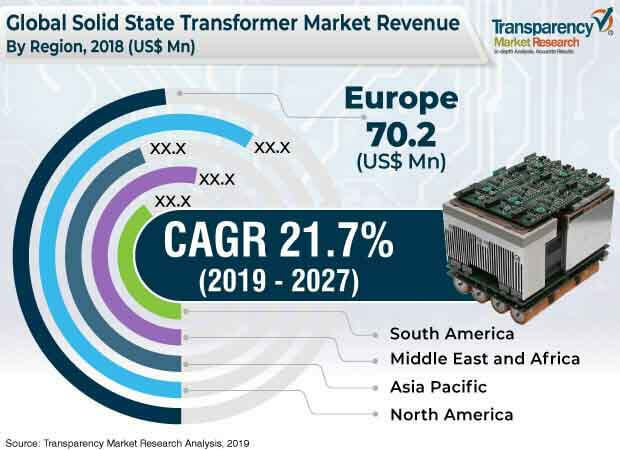 According to a new research report published by Transparency Market Research (TMR) , the global solid state transformer market is expected to reach value of US$ 1,141.0 Mn by 2027, expanding at a CAGR of 21.7% from 2019 to 2027. According to the report, the global market is likely to continue to be influenced by a range of macroeconomic and market-specific factors in the next few years. In terms of demand, Europe is projected to continue to lead the global market, with the market in the region expanding at a CAGR of 23.4% between 2019 and 2027. The global solid state transformer market has witnessed strong growth over the last decade. One of the major drivers of the market is rising demand for SST for use in high-speed trains and high-power electric locomotives. High-speed trains and high-power electric locomotives offer several advantages such as greater transport capacity, higher speed, reduced emissions, and energy saving. Furthermore, new types of high-speed traction drive systems required for high-speed trains and high-power electric locomotives use an inverter unit, a solid state transformer, a traction motor, and other key components in order to increase the system efficiency. Furthermore, solid state transformers used in high-speed traction drive systems with a high-power, high-frequency, LLC-resonant converter are useful to reduce volume and weight. SSTs also improve grid-side power quality. All these advantages are expected to increase deployment of SST-based traction systems in the near future. This, in turn, would drive the global market for solid state transformer during the forecast period. The global solid state transformer market has been broadly segmented in terms of product, component, application, and region. Based on product, the market has been divided into distribution SST, traction SST, and power SST. The power SST segment was dominant, holding 42.95% share of the global market, in terms of revenue, in 2018. However, the traction SST segment is anticipated to expand at the maximum CAGR of 22.6% during the forecast period. This growth can be attributed to increasing penetration of solid state transformers in the traction locomotive sector. In terms of component, the global solid state transformer market has been classified into converters, switches, high-frequency transformers, and others. The converters segment is expected to continue its dominance during the forecast period. The segment is expected to expand at a high CAGR of 22.3% from 2019 to 2027. Based on application, the market has been categorized into alternative power generation, traction locomotives, power distribution, electric vehicle charging, and others. Among these, the electric vehicle charging segment is anticipated to witness significant growth, expanding at a CAGR of 23.9% during the forecast period. This is attributable to factors such as favorable government initiatives and support, the issue of global warming, and increase in fuel prices. Electric vehicles offer advantages such as reduced CO2 emissions, low cost of running and maintenance, and eco-friendliness. Geographically, the global solid state transformer market can be segmented into North America, Europe, Asia Pacific, Middle East & Africa, and South America. Europe is anticipated to hold the maximum share of the global market during the forecast period. The market in the region is projected to expand at the maximum CAGR during the forecast period. In 2018, Europe accounted for 35.79% share of the global solid state transformer market. This is attributable to the large number of installed renewable energy sources and high investments in research and development activities in the region. The research study includes profiles of leading companies operating in the global solid state transformer market. Market players have been profiled in terms of attributes such as company overview, financial overview, business strategies, and recent developments. Some of the prominent players operating in the global market are ABB Ltd., Alstom SA, Amantys Limited, Eaton, General Electric Co., Gridbridge, Inc., Mitsubishi Electric Corporation, Schneider Electric SE, Siemens AG, and Varentec, Inc. Companies are focusing on expanding their business through strategic acquisitions and partnerships.